An investment in commodities could be timely, given the current relationship to historical prices. A tactical approach that mitigates risk makes sense in light of market uncertainties and the potential for dramatic price swings. On your mark, get set, co … mmodities! 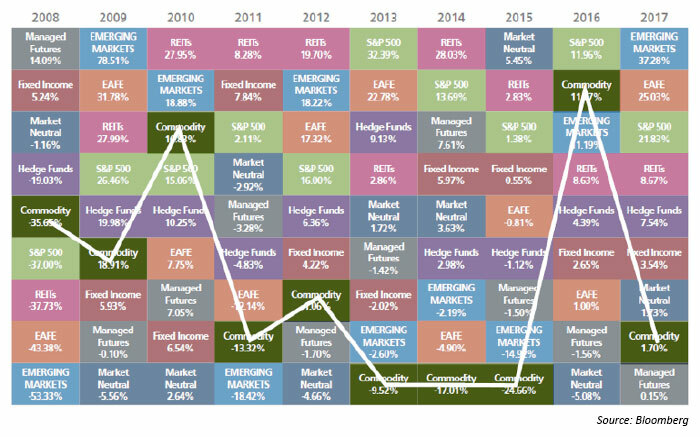 The past few years have been a difficult period for commodities when compared to U.S. stocks and bonds. A number of factors could be contributing to this, including a global growth slowdown (particularly in emerging markets), oversupply in certain commodities, no inflation to speak of, and historically low volatility (up until the past month). However, sentiment might be shifting in light of the tailwinds emerging for commodities—especially the improvement in the global growth story. It might be time for commodities to come out of the blocks in impressive fashion. Commodities are currently the cheapest they have been relative to the S&P 500 within the last 50 years. The S&P GSCI/S&P 500 price ratio helps illustrate this point (Figure 1). 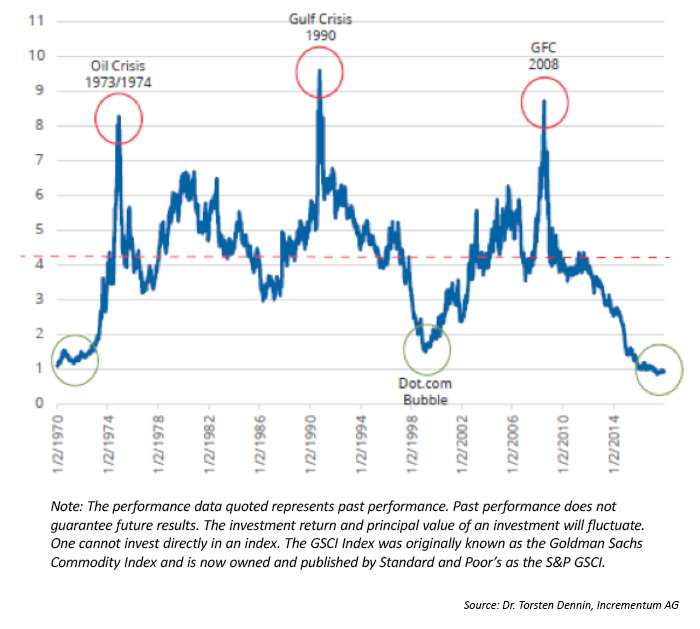 FIGURE 1: S&P GSCI/S&P 500 RATIO—EQUITIES EXPENSIVE, COMMODITIES CHEAP? One can make the case that an investment in commodities might be timely when considering their current value, as well as their historic averages. Additionally, emerging markets, which are major suppliers and consumers of commodities, were going through a difficult performance period relative to other equity markets. That tide started to turn in 2017, as emerging markets represented some of the stronger performing equity markets. This could be a good sign for a potential rebound in commodity markets. 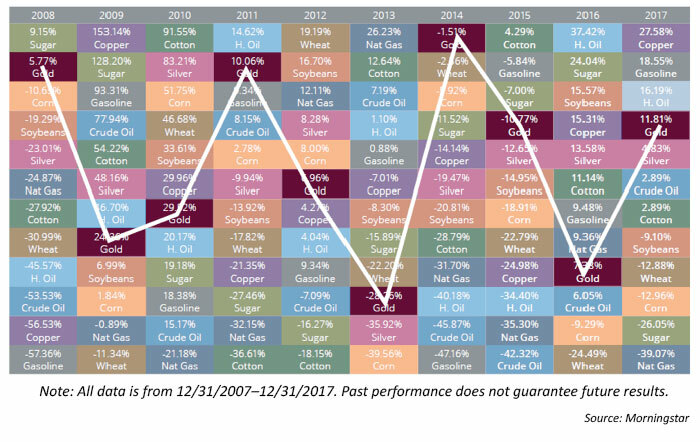 When looking at a Callan chart that includes alternative asset classes, one can see the underperformance of commodities both on an absolute, as well as relative basis, over the last 10 years (Table 1). The U.S. Trade Weighted Broad Dollar Index had its worst calendar year since 2011. 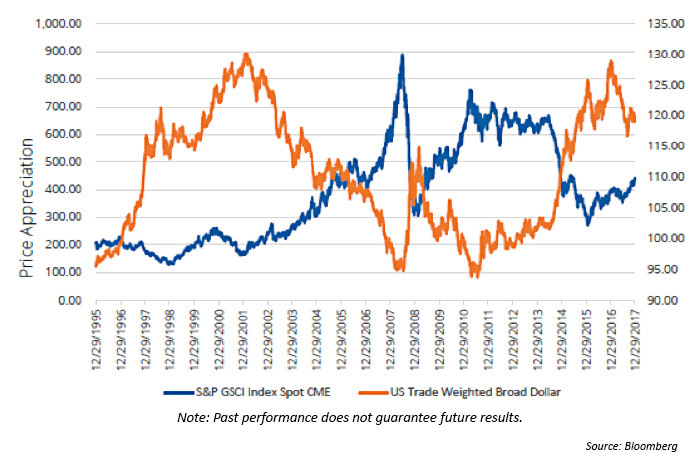 Historically, commodities have a somewhat inverse correlation to the Index, and a weakening dollar can lead to higher commodity prices, as shown in Figure 2.
Commodities have tended to perform better during inflationary periods, and, more often than not, a rising GDP has coincided with higher U.S. Treasury yields. 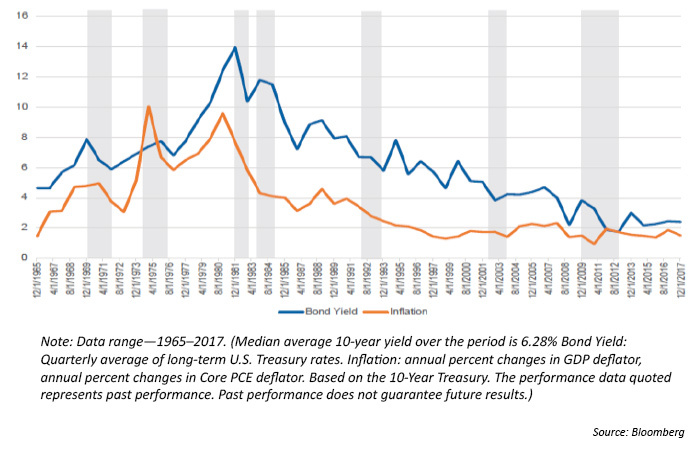 When looking at U.S. 10-year Treasury yields over the last 50 years, in roughly 80% of those calendar years, inflation and Treasury yields have moved in tandem. In other words, when GDP increased in a given calendar year, that also represented an increase in Treasury yields. Commodities are a way to potentially diversify an overall portfolio in a rising rate environment. Commodities can be volatile in nature and can experience significant gains and declines. In addition, individual commodities can behave differently from one year to the next. There can be a divergence in performance between different categories of commodities as shown in Table 2. This further illustrates the need for active, tactical strategies that are nimble and responsive to current market conditions when allocating to commodities. The changing nature of commodity performance, both as a total asset class and by individual components, points to the importance of investing in a commodity strategy that has the ability to be tactical in nature, smoothing out the ride. The Direxion Indexed Commodity Strategy Fund (DXCIX) and Direxion Auspice Broad Commodity Strategy ETF (COM) seek to track the rules-based Auspice Broad Commodity Index (ABCERI). This Index can be long or in cash with each of the individual 12 commodities that make up the Index, offering a tactical approach versus one that is long-only. 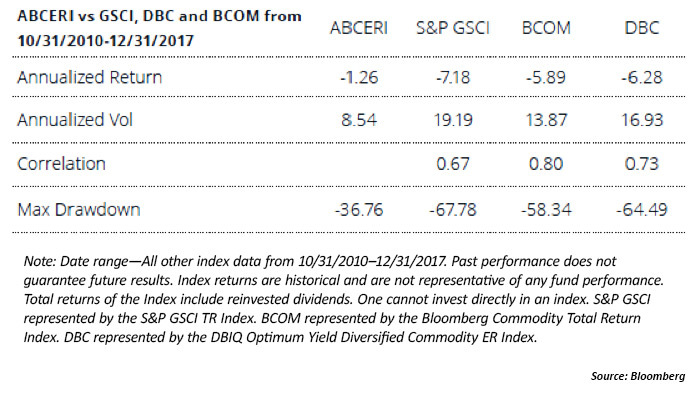 Since the ABCERI Index went live in the latter part of 2010, it has outperformed notable long-only commodity benchmarks over that time, with lower risk characteristics. Over the long term, commodities have shown the ability to be less correlated to stocks or bonds than one might expect, making commodities a potentially good diversifier within an overall risk-managed portfolio. In addition, during certain bear market periods in stocks and bonds, commodities have shown positive returns. While managing investment portfolios for clients should have a long-term focus, it is important to have the ability to be tactical at times, especially when it comes to the ongoing management of the overall asset allocation. In the case of commodities, it is imperative to be nimble, as the price swings can be severe. While the story of 2018 has yet to be written, the uncertainties around global currency relationships, inflation, bond yields, geopolitics, and actions out of Washington—especially on trade policy—place great importance on the risk mitigation that can be afforded by an actively managed investment approach. An investor should carefully consider a Fund’s investment objective, risks, charges, and expenses before investing. A Fund’s prospectus and summary prospectus contain this and other information about the Direxion Shares. To obtain a Fund’s prospectus and summary prospectus call 866-476-7523 or visit direxioninvestments.com. A Fund’s prospectus and summary prospectus should be read carefully before investing. Edward (Ed) Egilinsky is managing director, head of alternative investments at Direxion. Mr. Egilinsky’s focus is to drive Direxion’s product development initiatives and internal and external product messaging, as well as to provide support for product delivery. He also oversees the firm’s national accounts efforts. Mr. Egilinsky previously worked in leadership roles at Price Asset Management and Rydex Investments.